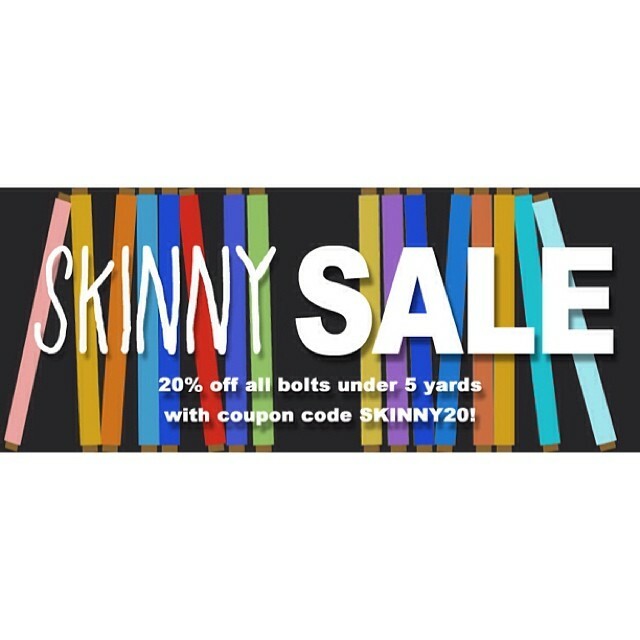 Pink Castle Blog: Skinny Bolt Sale! Take 20% off all our almost empty bolts this week with code SKINNY20 ! This week we are running one of my favorite sales. The Skinny Bolts Sale! We have over 500 almost empty bolts in our shop right now! Help us clear up some space! Check out the link to see everything in the shop that has 5 yards or less on the bolt. Take 20% off anything in this section by putting SKINNY20 in the coupon code section at checkout. The cool thing about this sale is the Skinny section changes as the sale goes on. New fabrics are added as people buy them! So, make sure you check back daily to see if there's anything new!